Millet, Robert L., and Gerald R. McDermott. 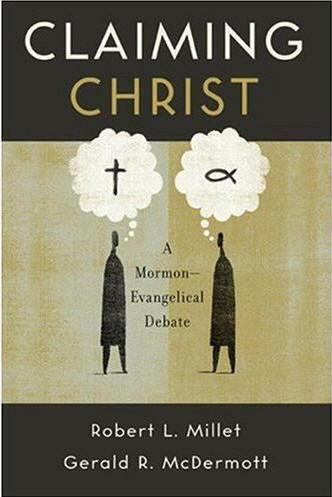 Claiming Christ: A Mormon—Evangelical Debate.Grand Rapids:Brazos Press, 2007. 238 pp. Millet, Robert L., and Gregory C. V. Johnson. Bridging the Divide: The Continuing Conversation between a Mormon and an Evangelical. Foreword by Craig L. Blomberg and Stephen E. Robinson. Rhinebeck,NY: Monkfish Book Publishing, 2007. xxxii, 185 pp. Cordial dialogue between evangelicals and Mormons, or Latter-day Saints (LDS), is a laudable exercise. This does not mean that the way such dialogue has occurred has been without controversy. In 1997, New Testament scholars Craig Blomberg (evangelical) and Stephen Robinson (LDS) co-authored a book entitled How Wide the Divide? A Mormon & an Evangelical in Conversation (InterVarsity) in which they explored their theological differences and agreements. At the time, many evangelical critics of the LDS religion expressed concern that the book conceded more common ground than actually exists. In 2005, Eerdmans published a book by LDS theologian Robert L. Millet (a professor at Brigham Young University) entitled A Different Jesus? The Christ of the Latter-day Saints, in which Millet presented an apologetic for the LDS view of Christ. Again, many evangelicals were critical of Eerdmans, a Christian publishing company with a broadly evangelical heritage, for publishing a book defending Mormonism. "Many evangelicals are likely to view Claiming Christ as the most troubling of the “LDS—evangelical” books to appear so far." Millet has emerged in recent years as the leading LDS scholar writing and speaking to defend Mormon beliefs against evangelical criticisms. In 2007 Millet (long a prolific writer) had three books published in this vein. He is the sole author of The Vision of Mormonism: Pressing the Boundaries of Christianity (Paragon), in which he defends Mormonism as an authentic form of Christianity. 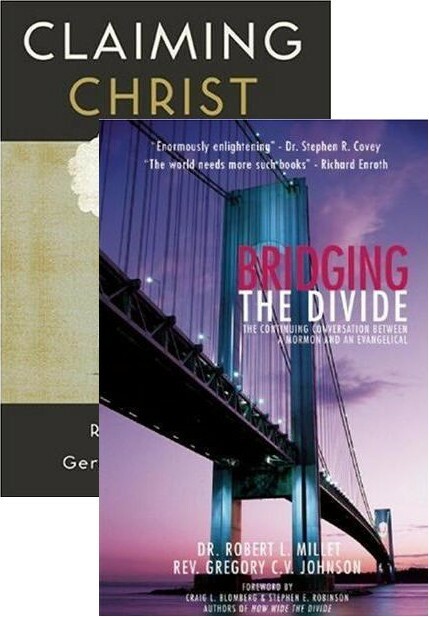 His other two 2007 books, both co-authored with an evangelical, are the subject of this review. In Claiming Christ: A Mormon—Evangelical Debate, Millet represents the LDS perspective while Gerald McDermott (religion scholar at Roanoke College in Virginia) represents the evangelical side. In Bridging the Divide: The Continuing Conversation between a Mormon and an Evangelical, we read what is presented literally as a conversation between Millet and Gregory Johnson, a former Mormon who converted to evangelicalism and became a Baptist pastor inUtah. Many evangelicals are likely to view Claiming Christ as the most troubling of the “LDS—evangelical” books to appear so far. For one thing, McDermott distances himself from the evangelical tradition on various issues, notably in his slighting of biblical inerrancy and his outright rejection of sola scriptura—the belief that Scripture is the sole infallible standard for doctrine and practice in the church (9, 16-19). In the context of a debate with a Mormon scholar, the repudiation of sola scriptura is a huge concession. He asserts that “some Mormon emphases are, in fact, theological improvements to some contemporary evangelical beliefs” (56) and repeatedly argues that evangelicals can learn much from Mormons theologically (especially 224-25). Millet, for his part, neither distances himself in any way from the LDS tradition nor offers similar concessions of what Mormons might learn from evangelicals. McDermott also makes controversial concessions regarding the soundness of LDS theology and religion. According to McDermott, Mormons agree “that Jesus was fully God” (16) and therefore, unlike the Jehovah’s Witnesses, affirm the “deity of Jesus Christ” (63). The reality is that Mormons and Jehovah’s Witnesses both affirm the “deity” of Christ but then redefine what that means. Mormons view Jesus as the first of God the Father’s procreated spirit sons and as having attained the status of a God; Jehovah’s Witnesses view Jesus as the first of God’s created spirit sons and as such the greatest of many subordinate gods. At one point, McDermott expresses delight that Millet agrees “that Jesus is God and is the only way to salvation (although evangelicals and Mormons disagree on what these things mean)” (60). But if we use the same words while meaning two different things, we don’t really agree after all. Most troubling to conservative evangelicals will be McDermott’s concession that Millet and other Mormons “participate in orthodox Trinitarian love of the one God among the three persons,” even though “this is not the way [Millet] would think about it” (88). Despite these controversial claims, the book offers some useful contrasts between orthodox and LDS positions on crucial issues. After Millet professed to believe that Christ is “the Eternal God” (46, 47), McDermott’s cross-examination forced Millet to explain that in Mormonism “Eternal” can mean merely for a very long time (61-62). McDermott rightly argues that Mormons believe in “a different God,” in Jesus as “one of (at least) several gods,” and that humans are of the same species as God (64-72). Such trenchant criticisms make his generous assessment of the spirituality of Mormons that much harder to understand. In Bridging the Divide, Millet and Johnson put into print form a conversation they report having had many times both privately and publicly. Johnson, it turns out, had facilitated the initial exchanges between Robinson and Blomberg that led to their book How Wide the Divide. That book sparked further discussions between evangelical and LDS scholars. Millet’s book A Different Jesus, published by the non-LDS firm Eerdmans, was one outcome of these discussions. In 2001, Johnson left his pastorate to found Standing Together, a ministry focused on fostering respectful dialogue between evangelicals and Mormons. Millet and Johnson began holding public meetings together in which they would ask each other questions and present their own views before live audiences. To date, they report having such public conversations more than fifty times. Bridging the Divide presents a dialogue in the same format as those public meetings. After an introductory conversation (Part I, 1-32), “Bob” and “Greg” take turns asking each other questions and offering their responses. These questions include such matters as the LDS claim to be the “only true church,” what is an evangelical, their views on grace and works, and the nature of God and man (Part II, 33-60). The longest part of the book is a selection from the authors’ answers to questions from their audiences on their view of Scripture, evidences for the Book of Mormon, the Trinity, baptism for the dead, whether Mormons believe in “a different Jesus,” and the like (Part III, 61-124). After a brief conclusion, Millet offers an appendix explaining why LDS theology is often difficult to pin down (131-48), while Johnson offers a lengthy appendix defending his advocacy of a “missional,” relational approach to Mormons in place of a “confrontational,” counter-cult apologetic approach (149-80). The book concludes with 25 “Guiding Principles of Constructive Conversation” (181-85). 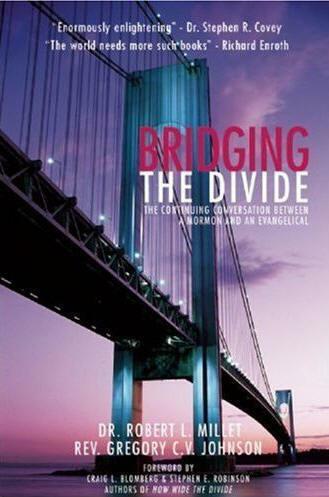 In theory, Bridging the Divide is an attempt to help evangelicals and Mormons understand each other better. In fact, the book focuses more on evangelicals viewing Mormons more sympathetically. In both Parts II and III, Millet does the majority of the talking, and much of what Johnson says is concessive: evangelicals need to be nicer to Mormons (70-71, 107-8, 124), evangelicals have often misunderstood Mormons (66), evangelicals can learn something from Mormon practices (100-101), evangelicals have some unfortunate divisions (45, 86-89), some evangelicals exalt faith and grace at the expense of works (47-49), and so forth. Again, Millet rarely makes such concessive statements (see 77, 87, 127 for the closest Millet comes to making such statements). Especially in this book, Millet shows himself a master at glossing over difficulties with LDS beliefs and practices. Consider, for example, the criticism that Mormonism encourages its members to base their faith on subjective experience by telling them to pray for a revelation confirming that the Book of Mormon is true. Millet responds by asking how some poor little old evangelical woman inMontgomery,Alabama, can ever have faith in Christ, if such faith must be based on knowledge of objective evidences. (The stereotypical assumptions here are arguably offensive, but let that pass.) Millet thus leads Johnson to agree that the woman could know the Bible is true by the witness of the Spirit—leading Millet to conclude that they believe the same thing about faith and reason after all (25-27). Millet’s argument here nicely avoids the real issue, namely, that Mormons routinely appeal to their “testimony” to deflect reasoned objections to the Book of Mormon (or to any other aspect of Mormonism). There is no denying that evangelicals need to do a better job of speaking in love to Mormons, and need to avoid some of the caricatures and virulent rhetoric that LDS associate with all “anti-Mormons.” Johnson has some good things to say on this point. Nevertheless, we also need to develop a strong, cogent apologetic response to Mormonism, especially in view of the success LDS scholars are having in getting their perspective heard. We do not need to choose between “relational” and “confrontational” approaches, or between “missional” and “apologetic” models—nor should we. Rather, we need to be both tough-minded and tender-hearted, both relational and forthright, speaking the truth in love. And if those of us who are apologists have problems with the way that McDermott or Johnson or others have engaged LDS scholarship, it is incumbent on us to do better. *This review was first published in the Journal of the International Society of Christian Apologetics, and is used here by permission. For information about the ISCA and its journal, please visit their web site.